A million ounces of high-grade gold in Ontario, open for expansion. A management team that has done it before. A major miner as joint venture partner. A potential new discovery near the kind of structural intersection that can carry considerable gold in this part of the world. And cash in the bank to go back and drill test it. 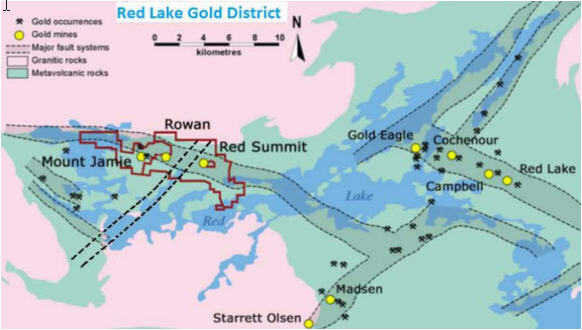 West Red Lake Gold Mines Inc. (RLG:CSNX) has the right property, people, structure and plan to potentially hit a home run in a gold market looking for high grades in good jurisdictions. RLG is headed up by Thomas Meredith. Meredith’s last company was VG Gold. He took the helm there when it was a broken company with a $3 million market capitalization. He cleaned up the management and board, and then focused on advancing and derisking the company’s four projects, which were all historic mines in the Timmins gold camp in Ontario. Under his leadership VG grew its resource base from 60,000 oz to 2 million oz, completed two PEAs, worked one project through a joint venture with Goldcorp Inc. (G:TSX; GG:NYSE), got permitting underway, and attracted Rob McEwen in as an investor, who took a 40% stake in VG through his company Lexam Exploration. About 18 months later Lexam and VG merged. By then, VG Gold had a market cap of $200 million. Now Meredith is working to do it again. RLG was a broken company when an active investor approached Meredith about coming in to fix it in 2012. Management was entrenched and not motivated; the geologists were academic, not practical. It took two years but Meredith cleaned out management and most of the board. Then he started advancing RLG’s asset: an Ontario property with historic mines in a joint venture with Goldcorp (sound familiar?). The property, called West Red Lake, is pictured above. The light yellow portions belong 100% to RLG. The beige parts are in joint venture with Goldcorp. 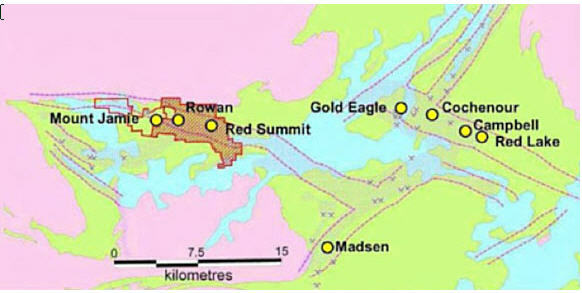 As for location, West Red Lake is in Red Lake area, which near the western edge of Ontario. On the map the yellow dots are all mines, some in operation today and some historic. The three historic mines on RLG’s property—Mount Jamie, Rowan, and Red Summit—sit along the east-west trending Pipestone Bay-St. Paul deformation zone, a regional structure that continues eastward off the property. 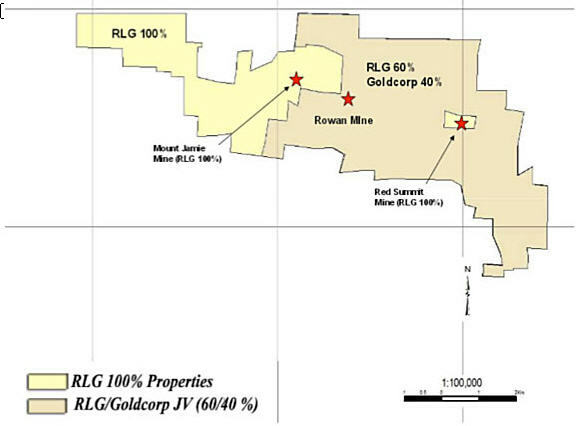 Most of RLG’s efforts to date have focused around the Rowan mine, where drilling and historic data support an inferred resource of 1.1 million oz, within 4.5 million tonnes grading 7.57 g/t gold. The resource comprises seven steep, sub-parallel zones striking east-west that have been traced 1,200 meters along strike and from surface to 350 meters depth (on average). Gold generally occurs as visible millimeter-scale blebs in quartz veins, veinlets, and stockworks, especially near folded lithologic contacts. Four of the zones (101A, 102B, 103C, and 104D) make up most of the resource. I will note that the veins are quite narrow. On its own, this resource is not likely enough to attract significant attention. But that’s not the reason for interest now—the resource could be the start of something bigger and is suggestive of the prospectivity of the land package. In terms of something bigger: the easiest path forward from here is to drill the resource at depth, where it is wide open. Red Lake gold deposits often improve at depth—better grades and widths—so a few deep drill holes would be very interesting. But the drill results RLG put out in March were not from the Rowan area. Instead, Meredith and his team decided to step out towards the other area of interest: 1 km to the east, where the east-west PBS deformation zone intersects the northeast-southwest trending Golden Arm structure (the more obvious dashed-line structure on the map). Intersections of this type are significant in the Red Lake camp. A similar intersection 20 km to the east essentially hosts two major, high-grade gold deposits—Red Lake and Campbell—plus a series of smaller deposits and occurrences. The recent six-hole program stepped 500 meters east from the edge of the Rowan resource towards the intersection. The first five holes returned low-grade gold from intercepts in the deformation package, like 1.24 g/t gold over 1 meter and 1.44 g/t gold over 1 meter. The sixth hole could be a discovery. It drilled into alteration associated with the intersection, returning intercalated argillaceous graphites, feldspar porphyries, and cherty-banded iron formations, with silicification along lithologic contacts. And at 297 meters depth the drill cut 1.5 meters grading 69.55 g/t gold. The concept is that this hit could be the western edge of the alteration zone associated with the intersection. The Red Summit mine could be the eastern limit. That leaves 1,500 meters of prospective ground in between: 450 meters from hole 24 to the intersection, 300 meters of intersection, and 750 meters eastward to Red Summit. RLG is a drill speculation, but one strengthened by a few key considerations. Red Lake ranks among the top 10 most desirable gold jurisdictions in the world right now. There are operating mines 20 km away. A discovery could turn into an acquisition target for one of those operators. RLG has a pretty tight share structure, with 88.6 million shares outstanding. Importantly, management owns about 17% and the investor who asked Meredith to take over at the helm owns 35%. Investors who did well on VG Gold and then followed Meredith into RLG own another chunk. In other words, 45% or less of the share count actually trades. Meredith wants a VG repeat and is working carefully to make that possible. He is very careful with spending. He just raised money for the next drill program and was careful to involve dedicated investors. With VG he was able to attract a few “financial sponsors”, as he calls them – major brokers whose active involvement make share prices move – and he will look to do that with RLG when the time is right. Geology and discoveries are important, but good investor and capital management are equally vital. RLG is about to head back for more drilling. Specifically, they will continue stepping holes eastward from the high-grade hit towards the structural intersection. Notable in that is the decision not to go for the easy ounces: they could spend half the budget drilling below the Rowan mine resource, where high-grade hits are almost guaranteed, but they are doing no such thing. Instead all the drilling will test the idea that the structural intersection offers gold. Each hole will step closer to it. How this story plays out will depend what those steps look like, but for now I am happy to participate in this high-grade Red Lake gold exploration speculation. 1) Gwen Preston: I or my family own shares of the following companies mentioned in this interview: West Red Lake Gold Mines Inc. I personally am or my family is paid by the following companies mentioned in this interview: None. My company has a financial relationship with the following companies mentioned in this interview: None. I determined which companies would be included in this article based on my research and understanding of the sector. Statement and opinions expressed are the opinions of Gwen Preston and not of Streetwise Reports or its officers. Gwen Preston is wholly responsible for the validity of the statements. Gwen Preston was not paid by Streetwise Reports for this article. Streetwise Reports was not paid by the author to publish or syndicate this article. 2) Interviews are edited for clarity. Streetwise Reports does not make editorial comments or change experts' statements without their consent.